Pierre-Emerick Aubameyang has scored a penalty to make it Arsenal 1-0 Tottenham in today’s North London Derby at the Emirates Stadium. 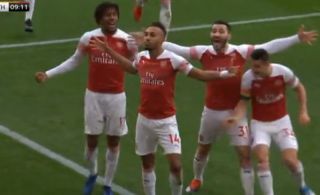 The Gabon international showed his composure in front of goal with an ice-cool finish from the spot, and he will have delighted Arsenal fans with his celebration. Aubameyang did his trademark flips and celebrated in front of travelling Spurs fans to rub it in. These two enjoy an age-old fierce rivalry, so Gooners will be thrilled to see Aubameyang embrace that and relish his goal against the old enemy this afternoon.